We're your best nightmare! 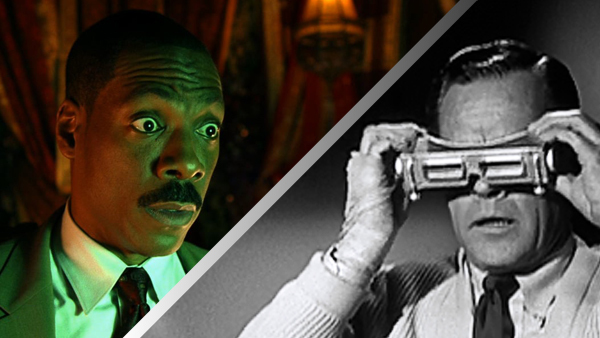 This week on Critically Acclaimed, by listener request, we're reviewing the family horror comedy "The Haunted Mansion," based on the Disney amusement part ride, starring Eddie Murphy. And we're pairing this expensive CGI would-be blockbuster with William Castle's ultra-cheap, but infinitely more effective all-ages haunted house classic "13 Ghosts!" Plus, reviews of the new releases "Adrift," "Upgrade," "Action Point," "The Misandrists" and "American Animals," and we also respond to more of your emails! Email us at letters@criticallyacclaimed.net and follow your hosts on Twitter at @WilliamBibbiani and @WitneySeibold! Head on over to the Schmoeville! Facebook page to contribute to our weekly polls, every Sunday, and force Bibbs and Witney to watch the bad movies YOU want them to watch! William Bibbiani Reviews "The Catcher Was a Spy"
The Beginner’s Guide to Movies: Where Do I Start?